Reading Wave is an innovative language arts program that incorporates brain-based learning techniques. Using Move and Play TM reading games, children can play, jump, run, dig, catch, build, and more, while learning to read. Some reading games come with toys included, and you’ll also use common items found in the home or classroom. The goal of the Reading Wave is to instill a love of reading and to make teaching fun and easy. In today’s digital age, online reading lessons are the norm. Yet, children are not gaining face-to-face human skills through a screen. Reading Wave gives families the best reason to unplug from their devices and bond with each other. Interactive learning environments at home will create long-lasting social skills, playful bonding time, and fun memories. Reading Wave is a multilevel language arts program for kids ages 3 to 8. The lessons are easy to use with siblings of different ages or in multilevel classrooms. Depending on the reading level, you can focus on learning specific steps using the color coding legend on the directions page or go through it all without the expectation of mastering every concept. Each reading level would benefit and enjoy all Move and PlayTM Reading Games. Use it again and again as your student grows. Click on the tabs below to learn more about each level. Children who are interested in books, recognize familiar print and logos, and can retell short stories are ready for Level 1. Students at this level usually do not know letter sounds, nor can they “sound out” or recognize whole words. They will be focusing on letter recognition, letter partners, and the sounds they make, for example “oo”, “ch” and “sh”. Children beginning Level 2 know all the letter names and sounds, and are able to recognize letter partners. They should also be able to sound out simple 2-3 letter words. Students at this level will focus on learning sight words. Children beginning Level 3 recognize all the letter names and sounds, can sound out or recognize at least 100 sight words, and are able to print legibly using simple grammar concepts. Students at this level will focus on strengthening their reading and writing abilities by using them to create meaningful print. You don’t have to be a teacher to use Reading Wave. On the contrary, Reading Wave helps the parent become a reading teacher to supplement what your child is learning in school, or prepare them for the upcoming school year. Every family who uses Reading Wave can become closer through human interaction and less screen time. Parents will better connect with their child through play, satisfy their child’s natural thirst for knowledge and attention, and create proud moments together. It’s fun for the whole family and ideal to use among siblings. Coming soon, when you register your purchase online, you can print additional workbook pages for each child or for the assignments your child wants to practice more. As with any busy family, we know the challenges of limited time. One thing is for sure: humans are creatures of habit. Anything new becomes effortless if you can make it a habit. Make Reading Wave your family’s habit and thrive together. Reading Wave is ideal for homeschoolers. It’s a comprehensive language arts curriculum that can be used over and over again as your children grow. The Move and Play Activities and Reading Games are fun in groups with other homeschool families and co-ops. A great resource for language arts tutors, learning centers, and literacy specialists. May be used to enhance remedial reading and ESL curriculum. Great for multilevel classrooms. In essence, most classrooms are truly multilevel because each child is developing at their individual pace. 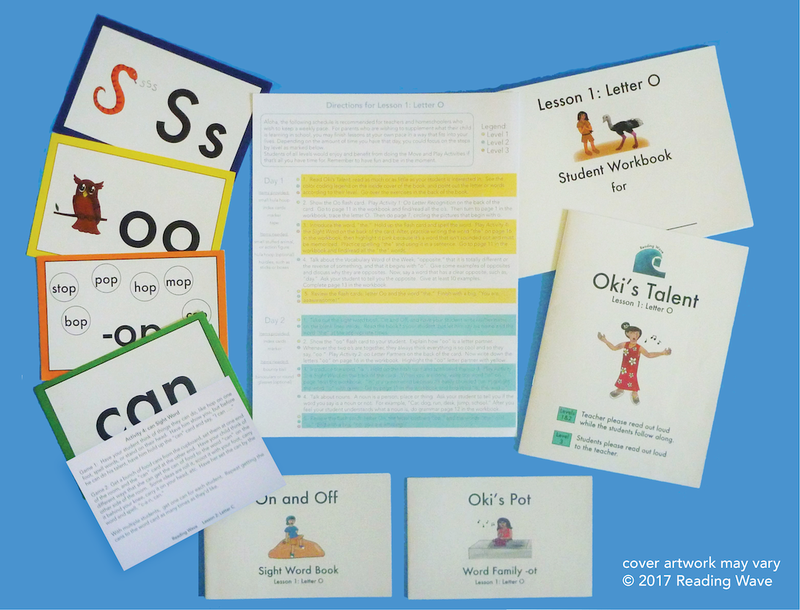 Each workbook will be available to print for each student. Small group and homework sets will be available for purchase. Move and Play Activities and Reading Games work best when you break into small groups. A list of items for the Move and Play Activities and Reading Games is found on the direction pages to prepare your classroom for lessons each week.